Below are 10 key facts about our health in Wakefield in 2017. Life expectancy has been rising. Data for 2016 show that based on current mortality rates, a baby born in Wakefield district today would live on average 78.0 years (male) or 82.0 years (female). For males this is 1.5 years less and 1.1 years for females than the national average values. 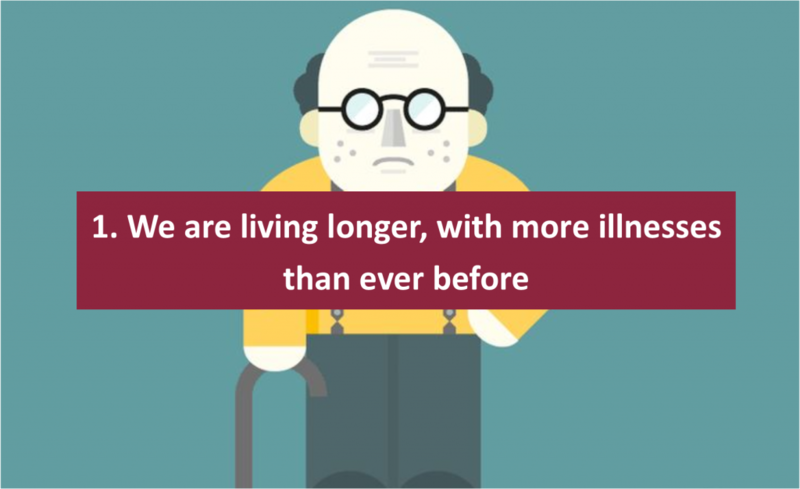 It’s great news that we’re living longer but the stats also show that we are spending much of the extra time suffering with poor health – around 16 years of ill health for men and 19 for women. In Wakefield males have over 10 years living with a disability, for females this is over 13 years. Without increasing illness prevention activity (e.g. through people consuming less alcohol, quitting smoking and eating well), we face creating greater levels of burden on the health and care system than we are already witnessing. As a health and care system we need to look holistically viewing wider issues that affect our health such as jobs, housing and our food environment to help reduce the impact on health and care. Wakefield’s biggest killers are cancer and cardiovascular diseases, the rates of death have seen great reductions since 2001 nearly halving. In the most recent 3 periods available, trends show that both cancer and cardiovascular disease in those aged under 75 is increasing in Wakefield. During the same period death rates from dementia and Alzheimer’s have increased by 60% in males and have doubled in females, partly due to our ageing population and greater awareness of dementia. As well as looking at causes of death (‘mortality’) the report also looks at major causes of illness (‘morbidity’). You might be surprised to learn that the biggest causes of morbidity in England are low back and neck pain followed by skin diseases, with depression in third place. Wakefield has seen a significant rise over the last 5 years in those who are off work due to mental ill health. The increasing levels of excess weight in the population is well known issue. Wakefield has over 70% of the adult population with excess weight, next to smoking excess weight has the greatest impact on population health. Health conditions that are due to or closely related to alcohol are at the highest levels seen for some time in Wakefield, nearly 3,000 admissions of this type occurred last year. Mortality for alcoholic liver disease has also increased greatly in recent times. Related to this is the number of violent crimes that occur both nationally and locally. This is a rising trend and the consequence of this, injuries caused deliberately, are rising too for our area. Infectious diseases such as Tuberculosis (TB) which are more of an issues in other districts, are low for Wakefield but regular monitoring to ensure that a large scale out break locally does not happen. Work to reduce the volumes of antibiotics that are used appropriately, to try and reduce antimicrobial resistance is another issues for England and Wakefield alike. Consumption of antibiotics fell across all healthcare settings for the first time in 2014/15.